Bar Keepers Friend is a manufacturer of premium all-purpose cleansers that work without chlorine bleach for everyday cleaning and tough stains including lime & rust. Their product line includes cooktop cleaner, soft cleanser, original power, and cookware cleanser and polish. In 1882, an Indianapolis chemist noticed how clean and shiny his tarnished pot was after cooking rhubarb. Using an active ingredient that's found in the plant he formulated a talcum-smooth cleanser and sold it to the city's taverns. 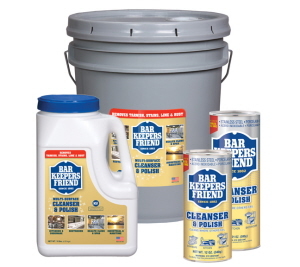 So pleased were his customers with how well it worked on bar fixtures, the product was dubbed the "Bar Keepers Friend"
Today, Bar Keepers Friend is still made in Indianapolis and is found at retailers throughout the world. Bar Keepers Friend Cleanser and Polish, a premium household cleaner, gentle but effective even without chlorine bleach or harsh chemicals. It is recommended for cleaning stainless steel cookware and sinks, glass and ceramic cooktops, solid surface countertops, porcelain and acrylic bathtubs and more. Bar Keepers Friend Cleanser and Polish is even effective in removing rust and tarnish from copper and brass. 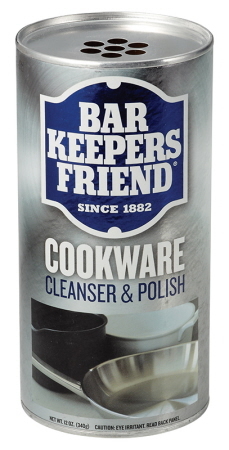 Bar Keepers Friend Cookware Cleanser & Polish has a non bleach formula effective for cleaning stainless steel cookware and keeping it looking like new. BAR KEEPERS FRIEND Cookware is a premium cleanser and polish that makes household surfaces shine like new again. It also gently cleans kitchenware made of copper, ceramic, hard-anodized aluminum and more. 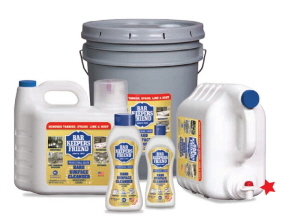 BAR BAR KEEPERS FRIEND Cookware is a gentle but effective formula works without chlorine bleach for everyday cleaning and removing tough stains, lime and hard water stains. Bar Keepers Friend Soft Cleanser is the best top-selling cleanser for removing rust, tarnish, hard water stains and lime scale. 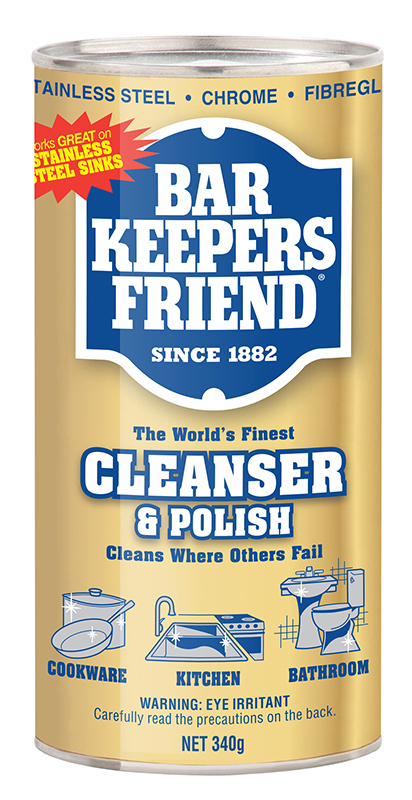 Bar Keepers Friend Soft cleanser, premium household cleanser. It has a non bleach formula, it's is recommended for cleaning stainless steel cookware and sinks, glass and ceramic cooktops, solid surface countertops, porcelain and acrylic bathtubs and more. Bar Keepers Friend Multi Purpose Cooktop Cleaner gently cleans glass and ceramic cooking surfaces. It removes burned on food without scratching and makes cooktops shine. 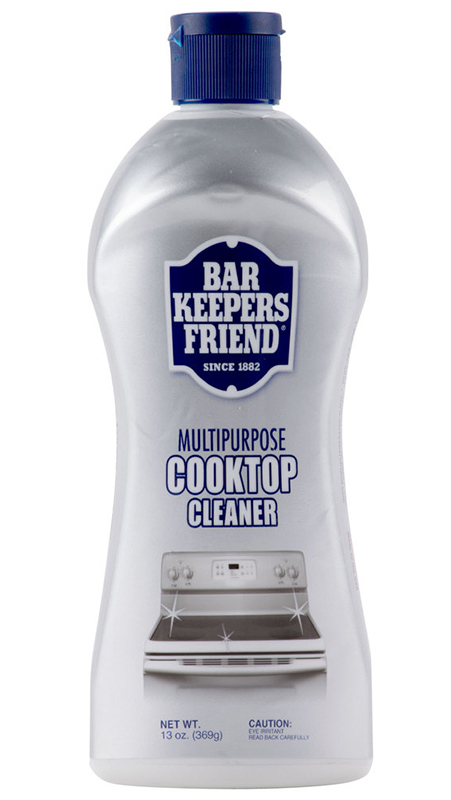 Bar Keepers Friend Cooktop Cleaner is a premium cleanser and polish that makes household surfaces shine like new again. BAR KEEPERS FRIEND Cooktop Cleaner gently cleans glass and ceramic cooking surfaces. It removes burned on food without scratching and makes cooktops shine. 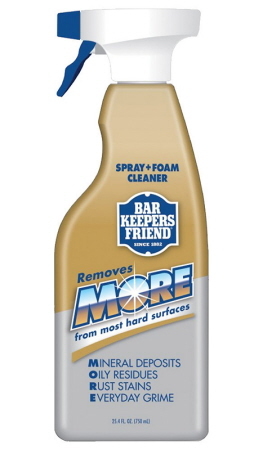 Bar Keepers Friend MORE Spray and Foam Cleaner is a non-abrasive, versatile, multi-surface cleaning product. Its non-bleach formula is safe on a wide array of surfaces, including stainless steel appliances as well as glass and ceramic cooktops. 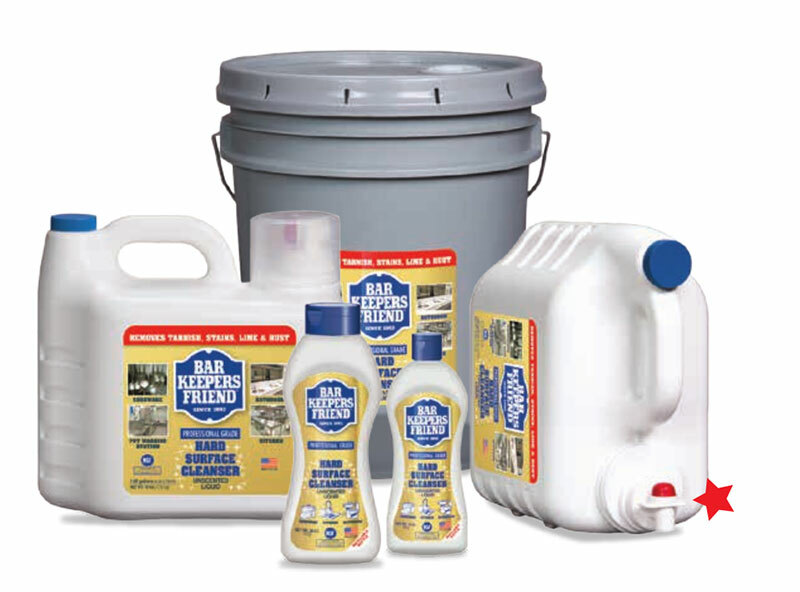 Bar Keepers Friend Hard Surface Cleaner is a biodegradable, thick liquid cleanser, mildly abrasive, it is a premium quality cleanser formulated with micro-abrasives for use on hard, nonporous surfaces: stainless steel, porcelain, ceramic tile, copper, and aluminum. - Cleans without dulling or scratching. - Removes difficult tarnish, hard water deposits, soap scum, and rust. - Thick formula clings to vertical surfaces, making it perfect for tile walls and restroom use. - Leaves a brilliant shine! - No hazy or gritty residue. Available in 6.28L and 19L.